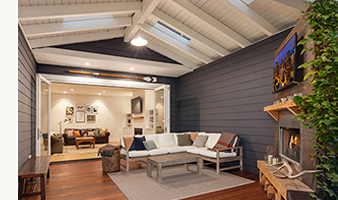 San Diego, CA (December 6, 2018) – LaCantina Doors (LaCantina) is pleased to announce the company was named as the 2018 Brand Survey Winner in the Bifold Doors category for the second consecutive year by Builder and Developer, a leading national trade magazine focused on production home building market. LaCantina was selected by a survey of Builder and Developer readers, who voted for their most preferred brands in product categories ranging from flooring, roofing, siding & trim, appliances, kitchen & bath, doors & windows, smart home technology and more. LaCantina’s innovative Bifold Door systems were the voter’s top choice again this year. The company’s folding systems are available in the most comprehensive range of material options including Aluminum, Aluminum Thermally Controlled, Aluminum Wood, Contemporary Clad, Wood and Vinyl to complement any architectural styles with performance options to suit all environments. “This is the 16th year the Brand Survey has been conducted and each year our readers continually recognize brands that are producing high-quality, innovative products like LaCantina,” stated Nick Kosan, Associate Publisher, Builder, and Developer. The complete list of Brand Survey winners will be featured in the December Issue of Builder and Developer. LaCantina is the leader in designing and manufacturing products that create large open spaces. Offering the most innovative and comprehensive range of folding, sliding, and swing systems available, LaCantina utilizes the same signature narrow stile and rail profile across its product line for a complete and perfectly matching door package. Designed and made in California, LaCantina has contributed to award-winning projects ranging from residential, retail, commercial, educational facilities, resorts and is the preferred choice when it comes to products that open spaces. Backed by an industry leading warranty, LaCantina is available across the U.S. and Internationally. LaCantina was acquired by JELDWEN in 2015. For more information on LaCantina, please visit www.lacantinadoors.com. Builder and Developer Magazine is the preferred home builder’s periodical and a national trade magazine focused on production housing and the homebuilding professional. Builder and Developer provide home building professionals with up to date news and information about the housing market as it pertains to home building and US housing market. Visiting www.bdmag.com for more information. Builder and Developer is owned by Peninsula Publishing, proudly serving the US Homebuilding business since 1990.